With the benign blessings and directions of Jagadgurus Pujyasri Shankaracharya Swamijis of Shri Kanchi Kamakoti Peetham, Veda Parayanam was held at Sri Swaminatha Swami Temple, Swamimalai on 31 March 2013 - Anusha Nakshatram, and on 16 April 2013 - Sukla Shasti day by 12 and 10 Vedic Scholars respectively from Rug, Krishna Yajur, Sukla Yajur, Kouthama & Jaimini Sakhas of Sama Vedams at the Dakshinamurthy Sannadhi. 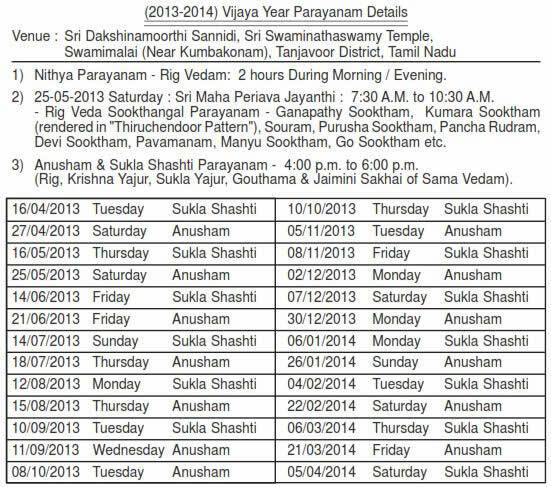 Rig Veda Nitya Parayanam which commenced on 20th September 2012, is being performed everyday. It is situated on a small artificial hillock near Kumbakonam, Tanjore district. 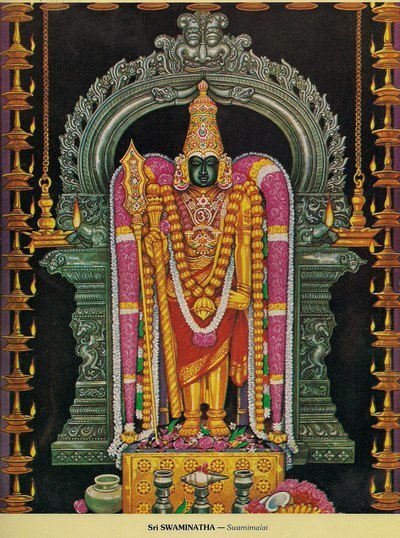 The six feet tall idol is known as Swaminatha, who is reputed to have initiated his father Siva into the power and meaning of OM the Pranava Mantra. The temple for Swaminatha, the son, is on a higher pedestal than that of the father(Siva).